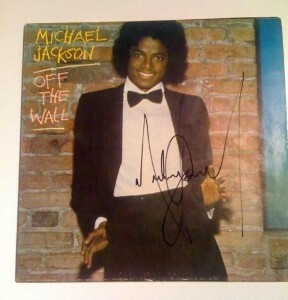 THIS RARE AND OUTSTANDING COLLECTION CONSISTS OF A MICHAEL JACKSON “OFF THE WALL” ALBUM IN PERFECT CONDITION, BOLDLY SIGNED IN FULL BY MICHAEL JACKSON IN BLACK INK. THE FOLLOWING STORY IS THE TRUE STORY OF A TRUE MICHAEL JACKSON FAN WHOM I HAVE HAD THE PLEASURE OF MEETING, HE HAS DECIDED AFTER ALL THESE YEARS TO PART WITH HIS TREASURED COLLECTION AND SHARE HIS STORY WITH YOU. THANK YOU FOR LOOKING AND THANK YOU FOR YOUR INTEREST, PLEASE FEEL FREE TO EMAIL US WITH ANY QUESTIONS YOU MIGHT HAVE. THANK YOU. MICHAEL BOUGHT THIS BOOK AT HOLLYWOOD BOOK CITY, THE BANK PRINT ON THE BACKGROUND IS SECURITY PACIFIC NATIONAL BANK. VERY COOL PIECE OF HISTORY FROM THE KING OF POP, SIGNED IN BLACK INK, PERFECT CONDITION AND ACCOMPANIED WITH THE SCANNED CERTIFICATE OF AUTHENTICITY PROVIDED IN THIS LISTING! CHECK IT OUT AND BUY IT NOW, LIKE STOCKS AND BONDS, COLLECTING SIGNIFICANT phentermine online MEMORABILIA SUCH AS A MICHAEL JACKSON PIECE IS SOMETHING THAT WILL ONLY GO UP IN VALUE OVER TIME. ONCE THIS ECONOMY FULLY TURNS AROUND, YOU WILL BE ABLE TO TURN AROUND AND DOUBLE YOUR MONEY OR KEEP IT FOR DECADES AND REALLY WATCH ITS VALUE INCREASE! DON’T BE FOOLED BY THE FAKES AND REPRINTS, BUY FROM A SOURCE YOU CAN TRUST, BUY FROM TRISH HESSEY AUTOGRAPHS! An autographed greeting card /dinner menu Hosted by Michael Jackson for his father’s Birthday Party (was a family only event) at the Neverland Valley Ranch in 1991, Michael named the Birthday party“JOSEPH JACKSON DAY”. Very rare and unique item from a Michael Jackson’s Family event. Signed in full by Jackie Jackson, Randy Jackson and boldly signed by Michael Jackson! Menu/greeting card approixmate size 5 x 7 on heavy stock paper. We offer a large variety of inventory consisting of all genres; rock and roll, historical, film, literature and much more. Please don’t hesitate to inquire if you are looking for something special. Trish can be reached at 1-909-484-8322 or by emailing trish@trishautographs.com. All items will be shipped via Priority Mail, upon receipt and clearance of payment. All items are to be paid for by PayPal which accepts all major credit cards. All payments must be made in U.S. dollars.